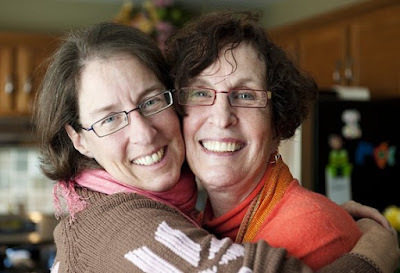 It's kind of a complicated story, but the short version is that Mom is moving to Denver from Wisconsin, and we are thrilled. The original plan was for her to move into the rental next door to us, but when she was here at Thanksgiving we went to look at some retirement communities with the idea of seeing what was out there and what the waiting lists were like. We figured she would probably need eventually to move into a place with more amenities than the Sergeant and I could provide. Turns out, she fell in love with the first community we looked at, and she decided she would rather move there instead of next door. She could make friends and get established there and enjoy it. So she put her name on the list. She was told it could be up to a three-year wait. So it's been a whirlwind of visiting and paperwork and putting the Wisconsin place on the market and and and. I'll be flying out there in another month or so. We'll drive to Colorado together. Can't wait! 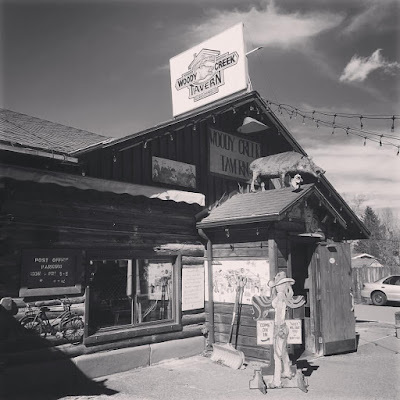 The Sergeant and I drove up to Basalt on Saturday to visit friends. Basalt is near Aspen, about three hours west of Denver. It was nice to get out of town a little. We stayed in an AirBnB that was big bedroom and bathroom on the ground floor of a mountain house, with our own entrance. I liked it fine, except it got noisy pretty early in the morning: the owners were hammering on something and their toddler was running around on the floor above us. Still, it was cheap(ish) and convenient. Our friends have two small children (hence the AirBnB) and enjoyed some adult interaction amidst toddler-wrangling. (That's one of their speedy little tykes above.) Good food and chatting happened. I also got some stitching done. Sunday morning we all drove through Woody Creek, where Hunter S. Thompson used to live, and into Aspen for lunch. It's such a pretty town, and the architecture is amazing. 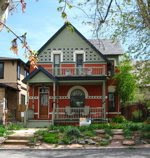 Restored Victorian cottages, some grander Gothic brick architecture, intermingled with lots of modern design. 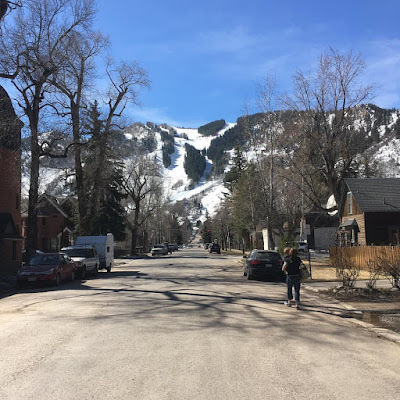 Everything is manicured and well-maintained because, well, it's Aspen. 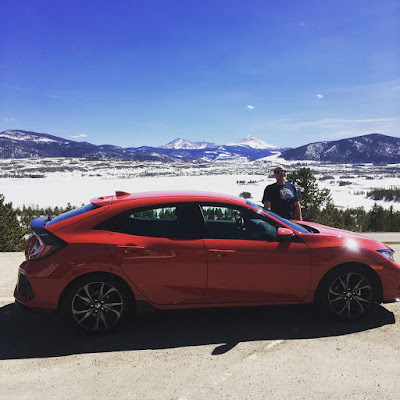 The drive back to Denver was uneventful, and not even too ski-trafficky. We had enough daylight left to do some watering and garden cleanup. My mom had to have her cat put to sleep today. 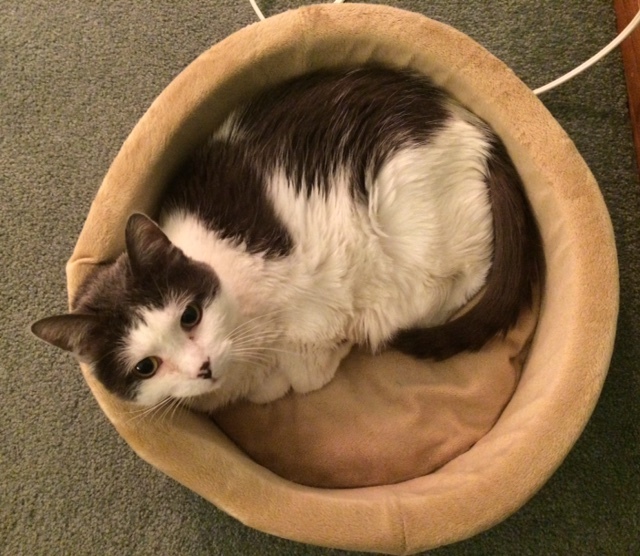 Charlie was a girl cat whom Mom named after Charles M. Schulz of "Peanuts" fame. Charlie brought Mom great comfort after a difficult time in her life. We found Charlie at a shelter in Wisconsin, and from the get-go she was chill yet vocal. She was a little cat compared with our big kitties (Enver, for example, totally fills this same cat bed to overflowing). But she had a big personality and lots to say. 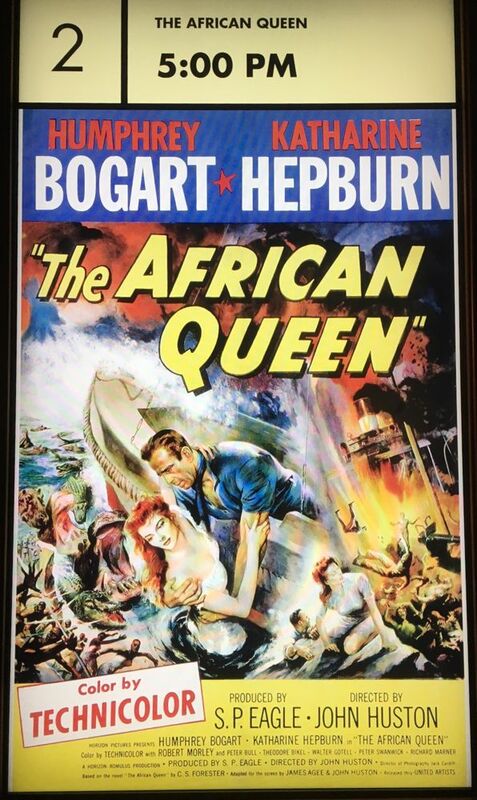 If you picked her up, she often sounded like she was about to tear your to shreds, but it was all just bluster. She secretly liked it. Late in life she even became somewhat cuddly with people other than Mom. 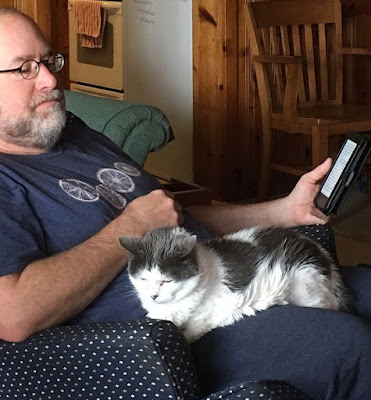 The Sergeant was thrilled to have her climb into his lap at the cabin last summer. She was skinny and arthritic, and I worried about her then. We're not sure how old she was, but close to 20. She had a good long life with Mom, and they loved each other a lot. The crocuses and Siberian irises have been up for at least a week, but I just noticed the daffodils today. I used post a photo of the first crocus every year, so I could tell if there was a big variation in when they appear. There isn't; they're pretty much like clockwork. It's quite possible that will get more snow and freezing temps this spring; our last big snowstorm is usually around April 10. What will make me sad is if the peach tree opts to bloom early (a strong possibility, with temps in the 70s all week). If we get a freeze after that, it'll put the kibosh on any peaches this year. 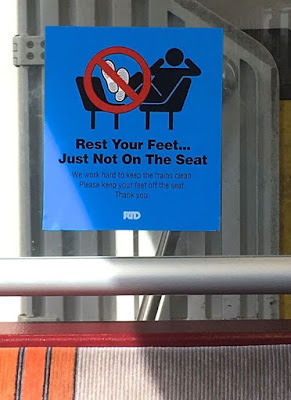 I'll confess, I sometimes get on the train and deliberately choose the seat opposite someone who's all sprawled out with their feet up. They usually react like their grandma just showed up and rapped their knuckles. 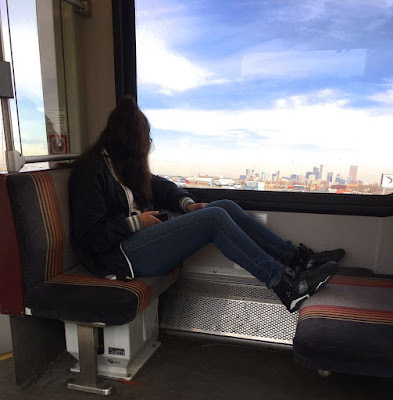 I'm not that old, but old enough, and clearly someone who has no time or inclination to deal with any of your attitude, you young person, so get your feet on the floor and sit up straight, already. I try not to let them see I'm playing Pokemon. Instagram filters make even mundane things look all artsy! These are some baby bell peppers we got in our CSA box at least two weeks ago. I meant to cook them right away, but life intervened. Happily, they last quite well in the fridge. 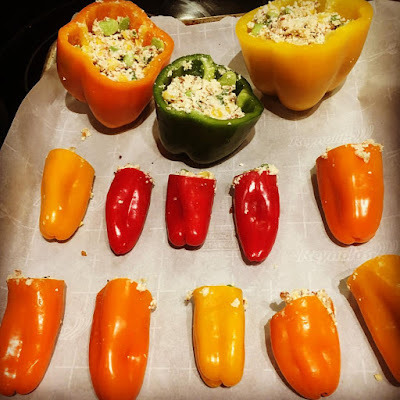 I supplemented with full-sized peppers in case I had extra filling (I did). The recipe is Giada di Laurentis' from Epicurious. She calls for frozen peas, which I am not fond of, so I subbed in corn and baby lima beans. I did not add any salt; the parmesan and pancetta add plenty of salt on their own. 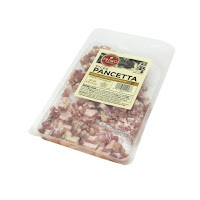 You can buy diced pancetta in the deli section; this is Safeway's brand, but there are many out there. I used to wonder why people would spend extra money for pre-chopped items that you could easily cut up yourself. Now I'm willing to pony up a little extra cash so I can get food on the table before 9 p.m. 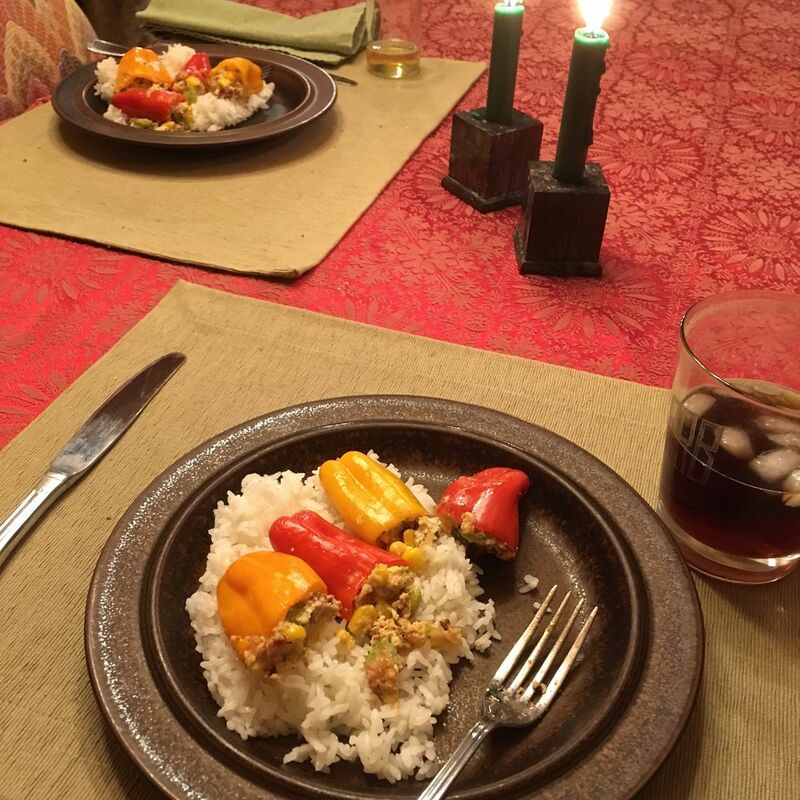 The peppers turned out quite well! The bright and fresh flavor of the still-somewhat-crunchy peppers balanced nicely with the rich filling. I think toasted pine nuts would be a nice addition to the filling next time. 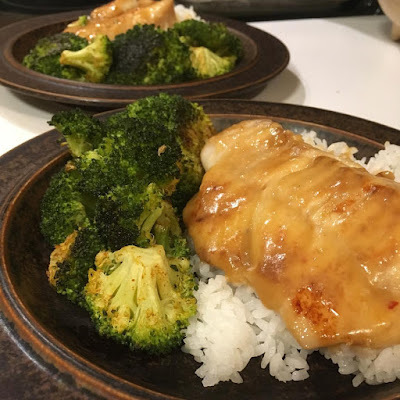 There will be a next time because the Sergeant also pronounced it good. Hooray! One of our go-to weeknight dinners is grilled cheese sandwiches and a shared can of soup (usually chicken noodle). Bonus points if we have some sliced turkey and a tomato to put in the sandwich. Last night, the Sergeant achieved extra-EXTRA bonus points by successfully tackling the no-knead bread recipe so I could use really, really fresh bread for our sandwiches. When I make no-knead bread, I prefer to use the Artisan Bread in Five Minutes a Day method (I find it more convenient), but the Sergeant is old school. 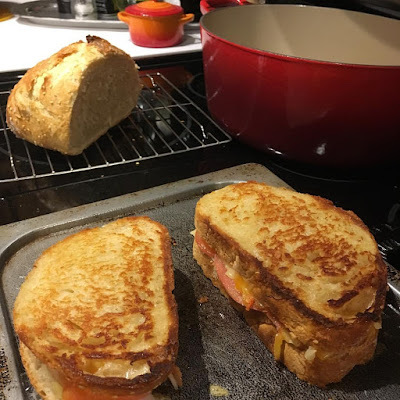 Either way, the bread is stellar, and the sandwiches were super-tasty. 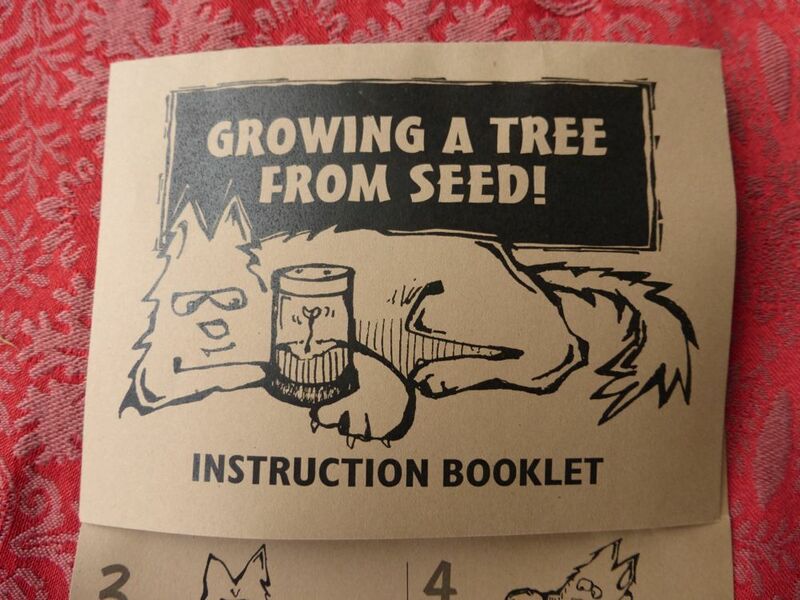 Before Christmas I saw a gift guide that suggested these "grow your own tree" kits. 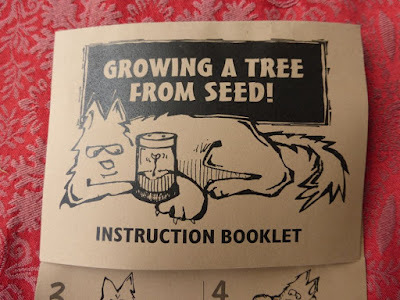 I knew this would be the perfect gift for the Sergeant, who loves growing and nurturing plants, and who wants to plant more trees in our yard that will produce food (we've got peach and apple trees, with a cherry on the way). He's super-conscientious about watering and feeding all our houseplants, most of which would have expired long ago if I were in charge of them. 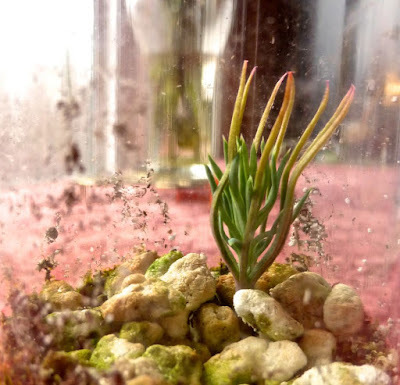 The company that makes these kits has many varieties, including trees such as gingkos, bristlecone pines and palm trees, and plants such as Venus fly traps, sunflowers and poppies. I debated over what kind of tree to choose, but the piñon is native to Colorado and produces pine nuts, which we love. So it wasn't a very long debate. 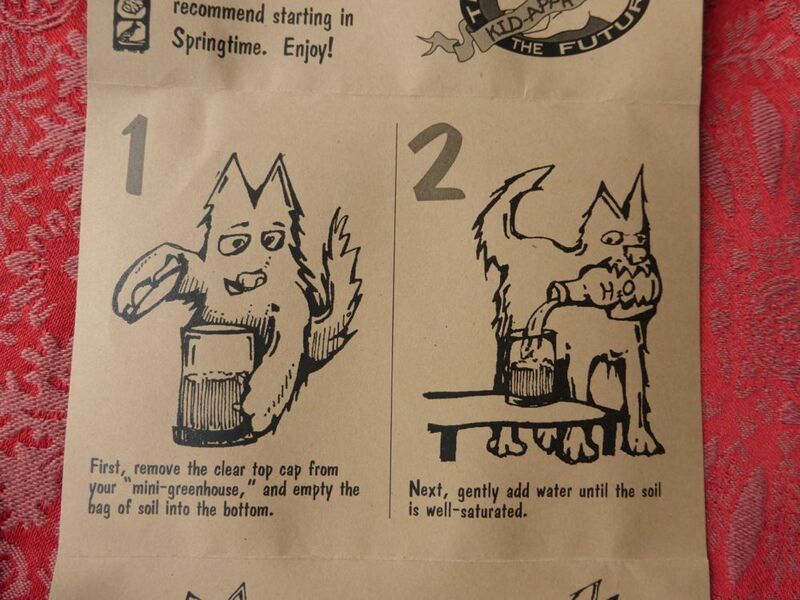 The kit is not large or complex — you could certainly just buy seeds and make your own — but it's nicely packaged and comes with charming instructions. That's what makes it a good gift. The process includes refrigerating the seeds for a while, then putting their little greenhouse in a sunny spot. Of the handful of seeds we got, just one sprouted (the company guarantees sprouting, so they'll send more if the first batch is a dud). I wish I'd gotten a photo of the little sprout with the seed husk still attached. The Sergeant finally pulled off the husk because it was constricting the top of the seedling. 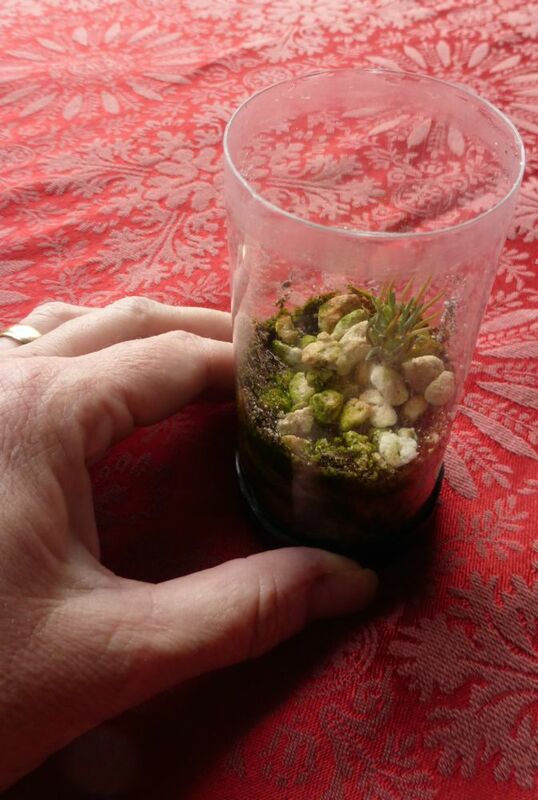 You can see it's quite tiny, this greenhouse, and the seedling is tinier still. 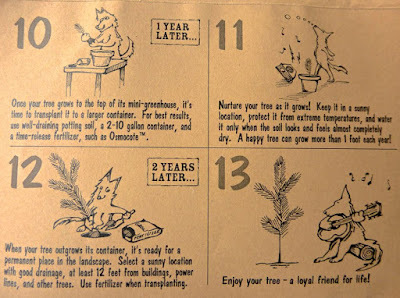 Eventually the seedling will grow big enough to be transferred to a pot and then, many years hence, transplanted outside. If you doubt the Sergeant's ability to keep this tree going that long, consider the wee Norfolk pine he got as a Christmas gift many years ago. The kind of mini Christmas tree you might find at the grocery store around the holidays. I posted about it 10 years ago (holy cow!) when it was 12 feet tall and he was "a friend" and not "the Sergeant." 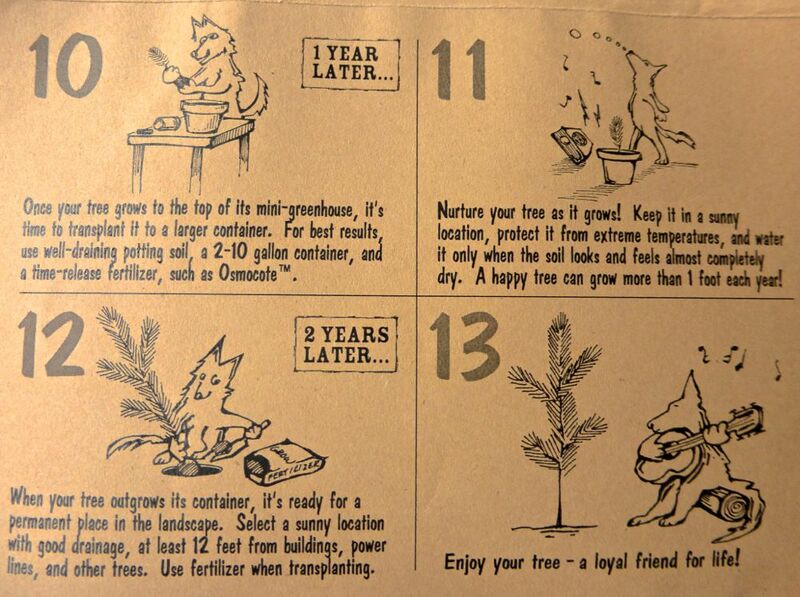 Now that tree is 35 feet tall, planted in his parents' back yard. 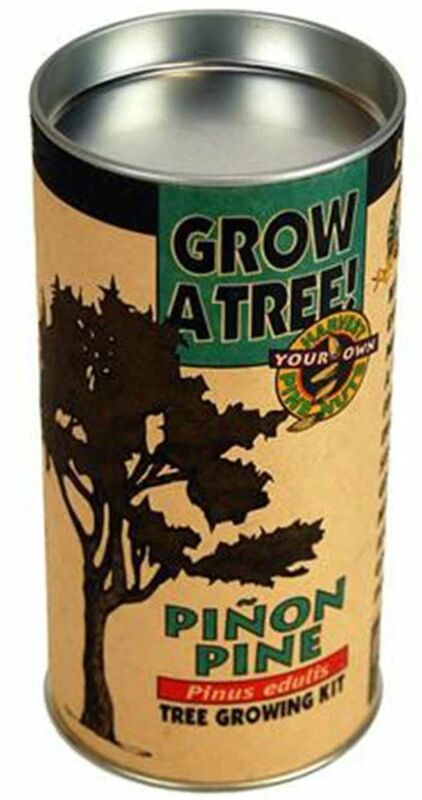 Grow Kits are sold by the Jonsteen Co. in Humboldt, California. Click here for a list. I was visiting my friend's parents the other day and spotted this on a shelf in a storage room. Whoa. Trash-80! The TRS-80 was made by Tandy/Radio Shack starting in the late '70s. I never had one, but I remember playing with them a little. In college, my first computer was the DEC-10 mainframe. I figured out pretty early on that you could chat with people on other terminals, and there was a text-based game called Adventure (or Colossal Cave) that you could play on it. 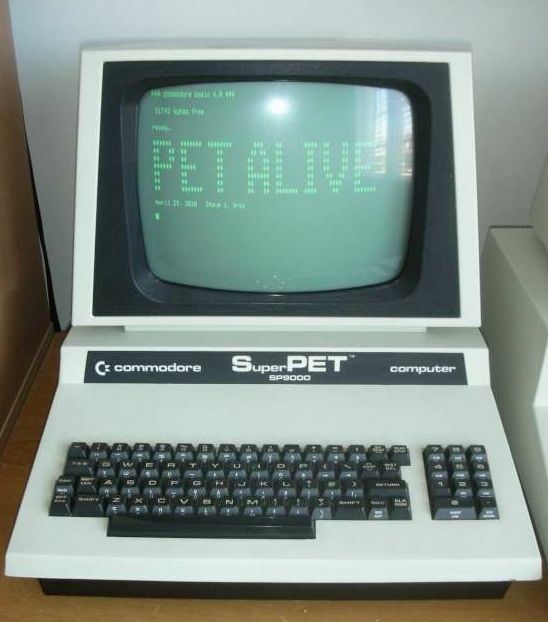 Then someone introduced me to the Commodore SuperPETs in the Engineering School, and I learned how to use a word processor. A very primitive one, but way better than typing and retyping papers on a typewriter. Plus, it was in that brief, shining moment when you could tell professors that your paper was late because the printer was broken, and they would be impressed. 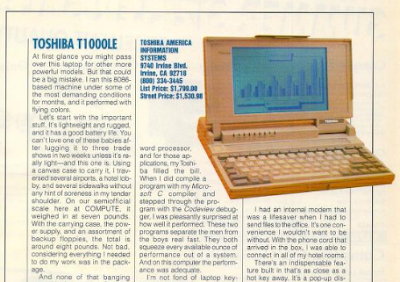 In the early '90s I had a notebook computer (now known as a laptop), a Toshiba T100LE. I would take it to a coffee shop and plug it in (the battery wouldn't last more than a hour or so). People would come over and ask me about it. "Wow, is that a computer?!?" Yes, that's how much it cost, which is about the equivalent of $2,500 today. I used a chunk of my graduate student loan to buy it. It was totally worth it. You'll notice it didn't have a mouse or trackpad. Those things didn't exist yet. "Back in my day, you whippersnapper, we DIDN'T EVEN HAVE A GODDAMNED MOUSE." Yeah, you had to use arrow keys to navigate around. 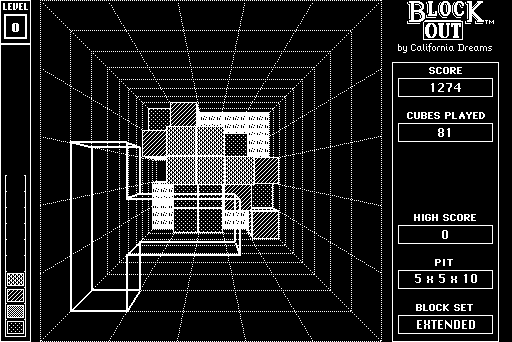 You also used the arrow keys to play games such as Block Out, which was a bit like Tetris. Later I had one of those cute colorful iMacs (lime green! ), and today I'm writing this on a Macbook Air, which is a great little machine and unimaginably more powerful than even that mainframe computer I first used that occupied an entire room. I missed a couple days of posting because Mom was in town for an unexpected visit. More on that later. 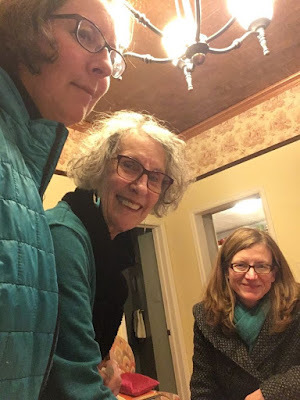 But while she was here, we took the opportunity to go see Patricia McConnell at the Tattered Cover, our local independent bookstore. We went with my friend Jenny (above right), and we were all color-coordinated in teal and black. Completely unintentional. Dr. McConnell was very gracious and gave me some good stories, which I remember to this day, more than 20 years later. She has also written a few books since then, had a public radio show ("Calling All Pets") and started her own blog, "The Other End of the Leash," which should should read if you're interested in dog behavior. 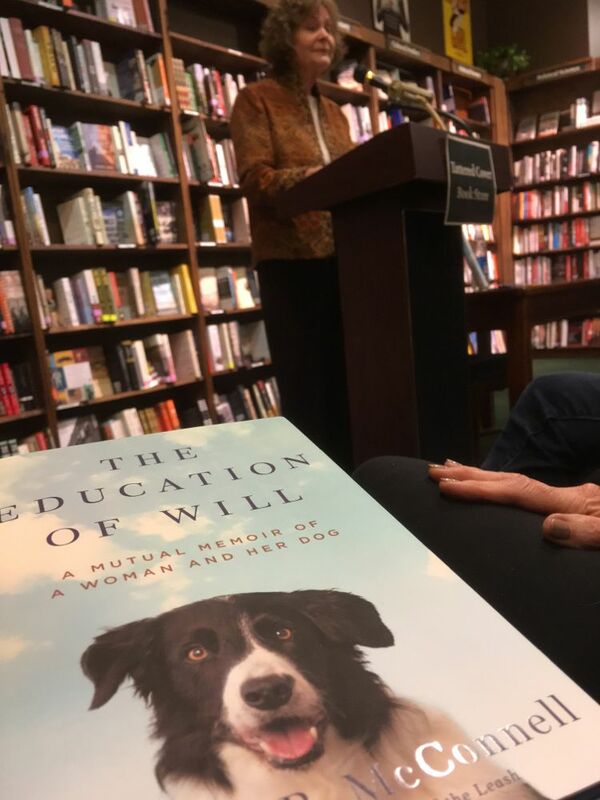 Her previous books have been more specifically about dog behavior and training, while her newest, "The Education of Will," is as much about her as about Willie, the best and worst dog she's ever had. Though she got him as a puppy from a reputable breeder, he turned out to exhibit PTSD-like behaviors. He was severely noise-reactive, and aggressive to other dogs. 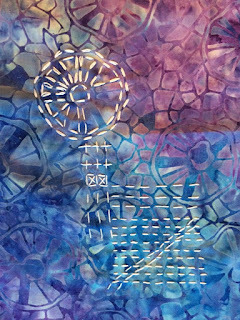 In trying to figure out how to help him and train him (and even whether to keep him), Dr. McConnell was forced to confront her own past traumas and issues. This book is the story of that process and journey. The presentation was fascinating and engaging and moving. I really enjoyed it, and I look forward to reading the book. 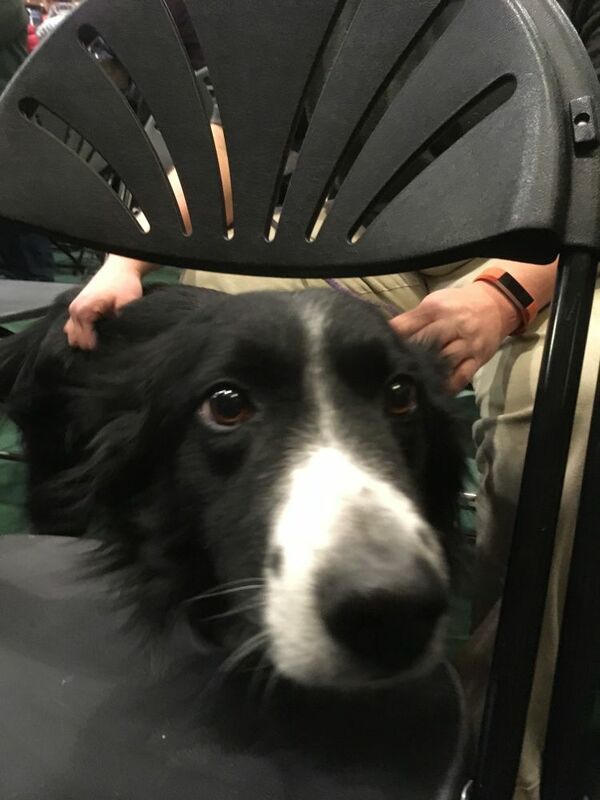 There were a few canines in the audience, too; assistance dogs in training. That's Specter on the left and Talent on the right. 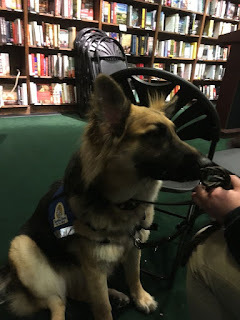 It was a good turnout; I think the Tattered Cover underestimated how many fans would turn up. Jenny and I got our books signed; and Dr. McConnell even remembered Jenny, or at least recognized her as someone she knew once upon a time. Mom was happy to go, too, as she used to listen to "Calling All Pets" on Wisconsin Public Radio. If you have a chance to see Patricia McConnell speak, you should go. Or at least read her book! The Sergeant had a birthday party Sunday that involved an engine swap, loud music, a lot of grease and broken tools. Meanwhile the gals came prepared to knit or stitch, mainly because the topic of sashiko came up in a Facebook discussion beforehand. 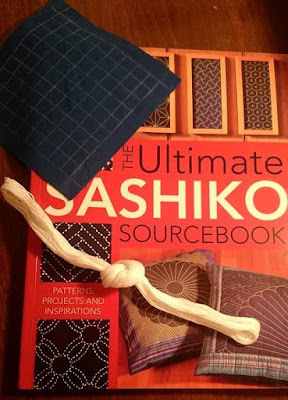 Turns out Amanda had recently bought sashiko supplies, as had I, and Mona was curious about the technique. 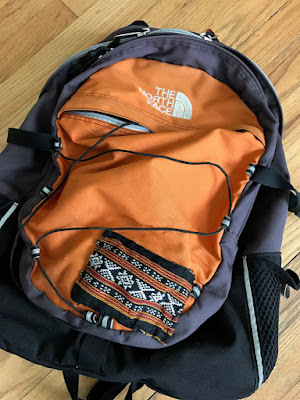 I had this little square of fabric that matched nicely, and it sure looks better than the duct tape Jenny was going to use. 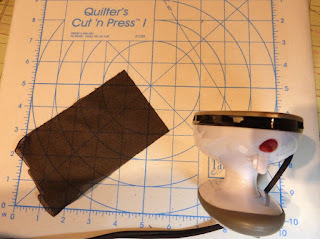 I put some of that Cloud Cover fusible on the inside to protect the stitching from snags. 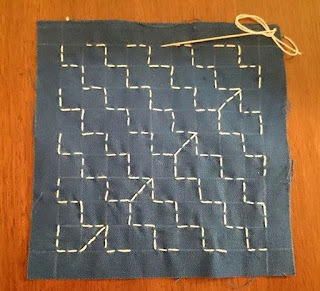 Meanwhile, Mona was playing around with the sashiko needles and thread on a piece of batik from my stash. 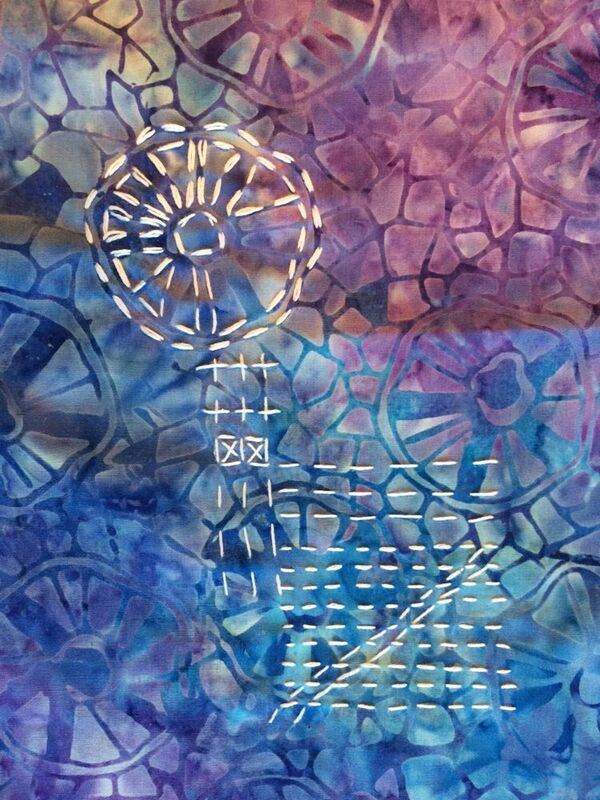 (I have so much batik quilting cotton, it's a little embarrassing.) She sent me this photo later. 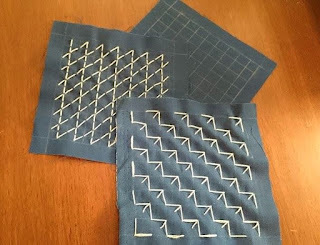 I like the idea of stitching to outline some of the patterns on the fabric. 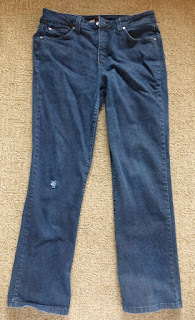 I need to play around with that on the jeans-patching I plan to do. Possibly as soon as today (we have a new little sewing club at work that meets at lunchtime on Fridays). Amanda was the stitching star of the party. 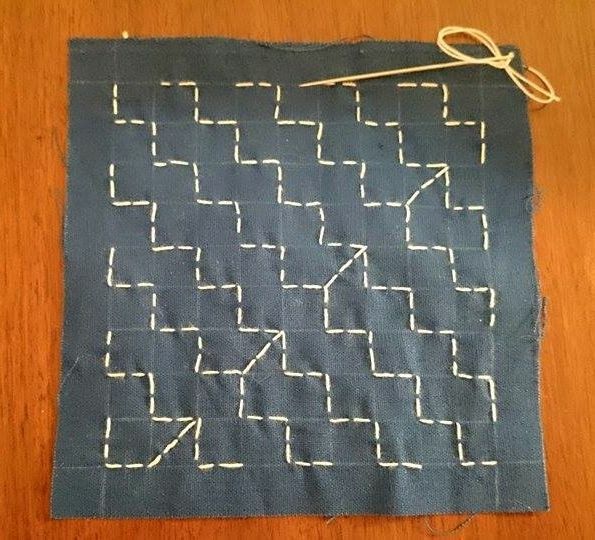 Turns out we'd both ordered the same sashiko book and needles from Amazon, but Amanda had also ordered indigo linen from fabric.com and marked up grids to practice stitching patterns from the book. Meanwhile, I'm still reading the introductory chapter. But I'll get to the actual stitching one of these days! 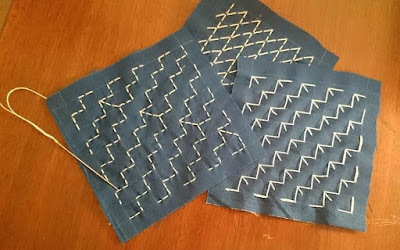 According to Amanda, who was kind enough to send me photos after the fact, the pattern in progress on the left, above, is called Yabane, or "arrow feather," on Page 75 of the sashiko book. The one on the right is called Dan Tsunagi or "linked steps" (Page 99). The one on top is an attempt at Kagome or "woven bamboo" (Page 100). 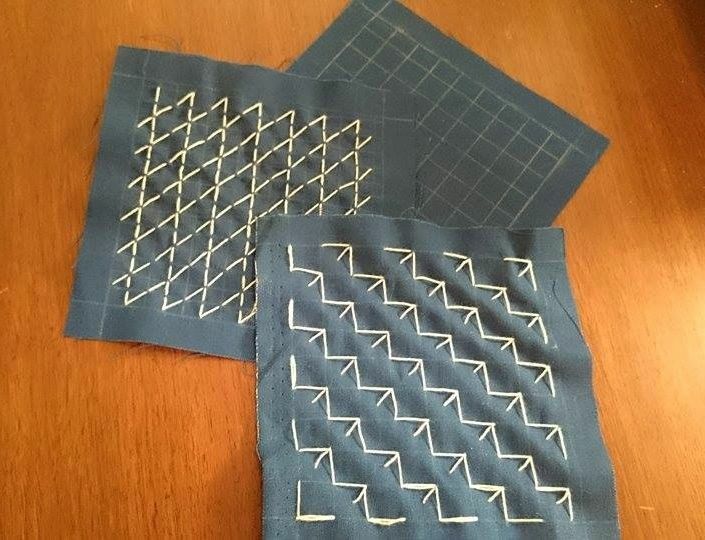 These little squares could become coasters or bags or even denim patches. I'm tempted to order some linen myself, but I've got an upcoming trip to the Bay Area that might include a trip to Japantown. So I'm restraining myself until then. I have plenty of other projects I can play with in the meantime. One advantage to seeing movies at Alamo Drafthouse as often as we do is the invitations to free screenings. Tonight we went to an advance showing of "Get Out," which will be released in most theaters this weekend. 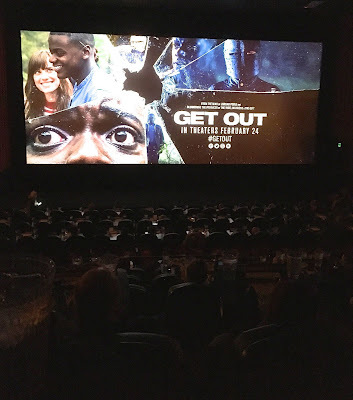 It's billed as a horror movie, but it's more psychological thriller, directed by Jordan Peele of Key & Peele fame. The story is about a black guy and his white girlfriend going to visit her parents in their rich suburb. It becomes clear pretty quickly that there is something very weird and very wrong going on. I'm not generally a big horror movie fan (though Silence of the Lambs is one of my favorite movies), but I thought I'd take a chance on this one, it being free and all. It sounded somewhat intelligent, and it was. 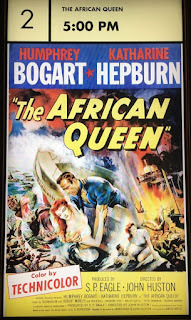 There was a lot of sly humor and social commentary. And the horror came with some twists I was not expecting. Joe Bo says go check it out! 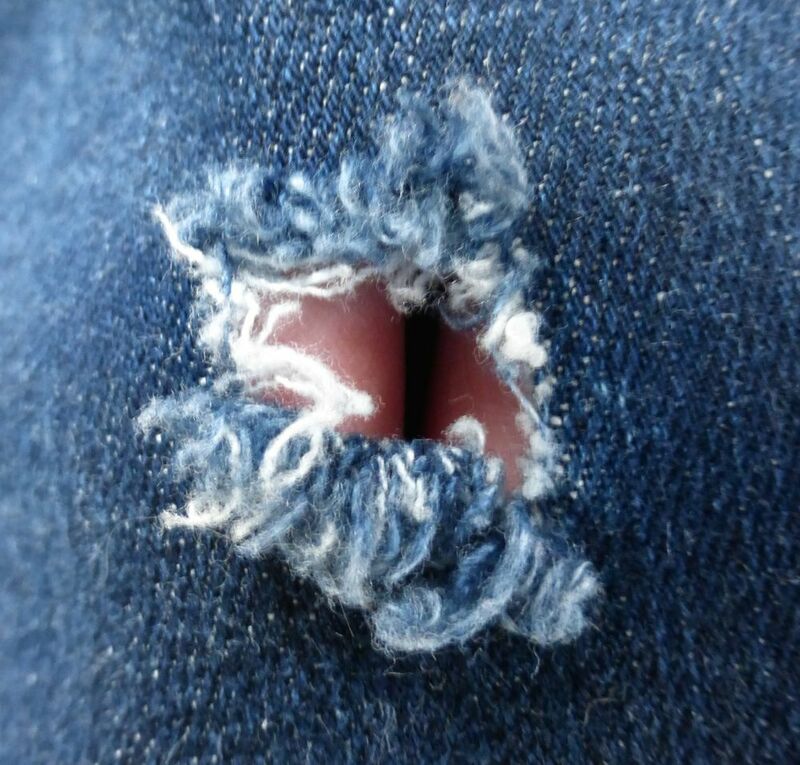 I posted a while back about my ripped jeans. I was contemplating putting a patch of some kind on them and doing sashiko stitching over the patch. 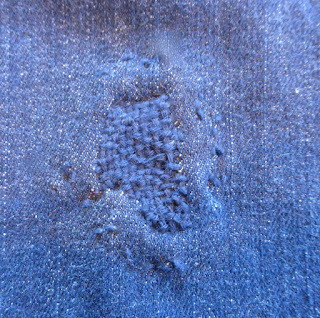 But then I learned about darning. 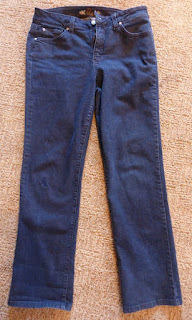 And it happened that I'd ordered dark indigo sashiko thread that matched my jeans almost exactly. The lighting on these photos makes the denim look a lot lighter than it really is. 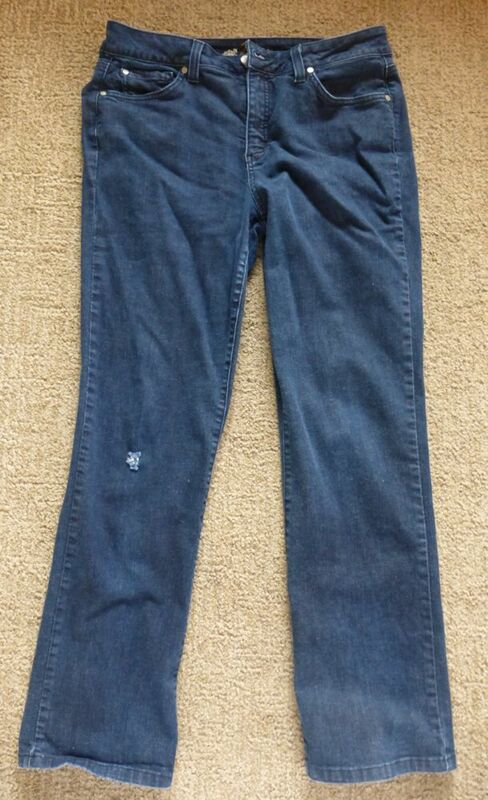 I wore these jeans today and you could not see the repair unless it was pointed out. I had a solution for the inside of the repair, as well. 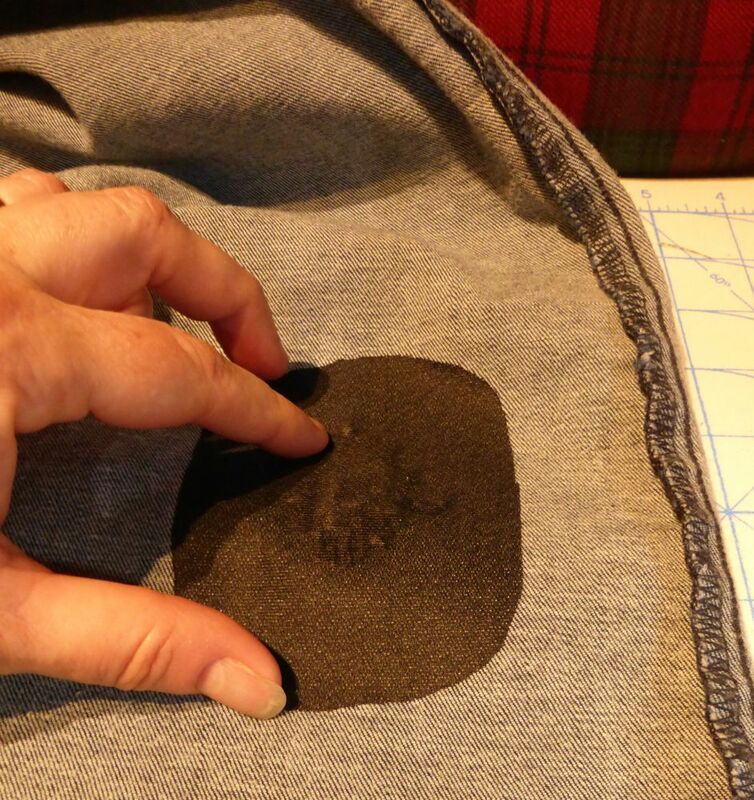 A friend suggested using Pellon Cloud Cover, a fusible product designed to cover up embroidery stitching on baby items. 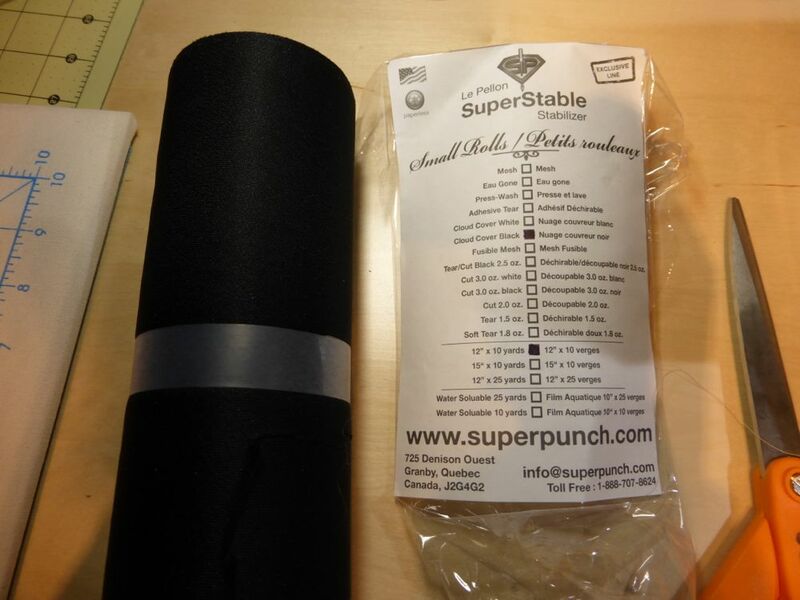 It's called a stabilizer, but is pretty flimsy and filmy for that. I ordered a roll from Amazon. 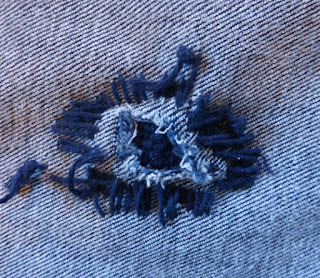 It fused quite nicely to the denim, helping secure and protect the stitches, and keeping the knots from being irritating. We'll see how it holds up in the wash! 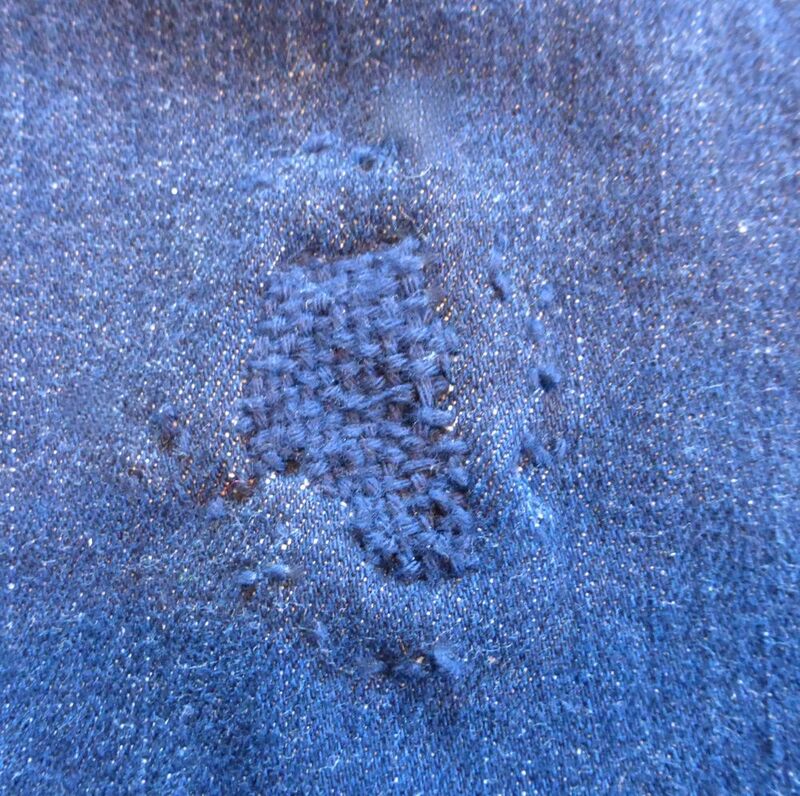 One of these days I'll sit down and write a darning tutorial. It really is a useful skill.